← Why can't search sites show real prices? When is the best time to buy your ticket? I’ve heard different advices. Some say you should book your ticket 3 months ahead, other have said it’s cheapest on Tuesday evening. Are these advices true? The true answer is that there is no general answer. It depends on a lot of different factors. When during the day or which day of the week you book your ticket usually doesn’t influence the price that much (while it can indeed affect price to some extent). What do have an influence on price though is how long in advance you book your ticket. Sometimes you can see some article where they have “analysed X amount of data” and found that you should book your ticket Y weeks before departure. The problem with these articles, and what they usually neglect, is that it all depends on which route you are flying - and when during the year you are leaving. Say we are living in Gothenburg and want to fly to London. 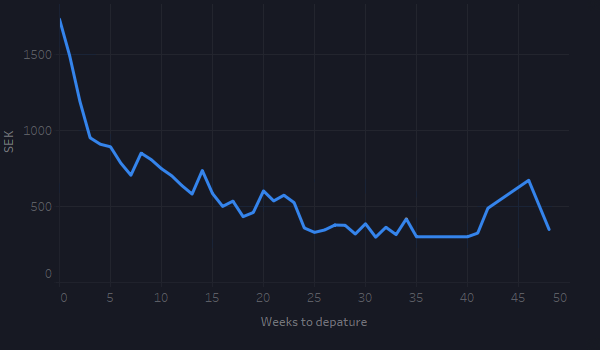 If we neglect when during the year we are actually leaving, the graph below gives us an idea about how long in advance we should book our ticket. 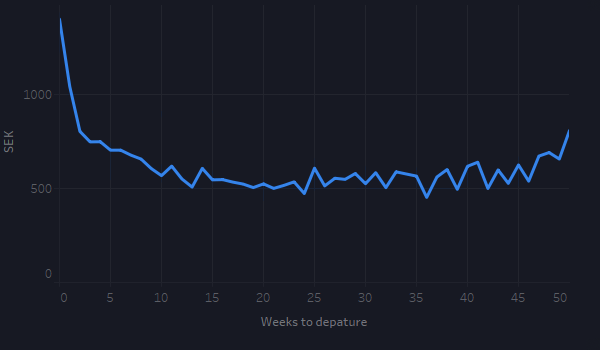 In this graph we can see that about 21 weeks before departure seem to be a good time to book the ticket. Now, if we assume that we are leaving in August, the most popular month, the graph would look very different. Suddenly about 35-40 weeks before departure seem to be the time to book your ticket. 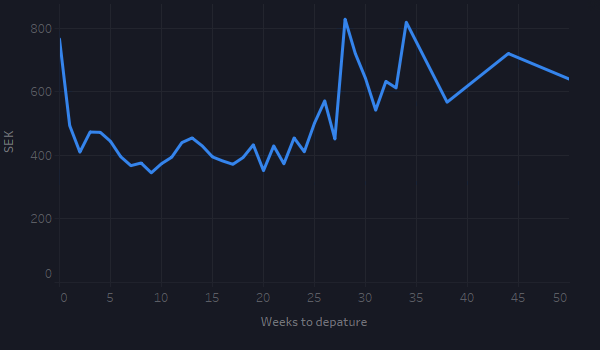 If we then instead intend to fly there in February, the least active month, we have another graph. 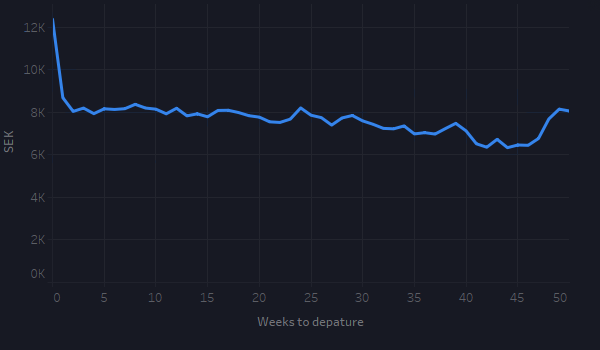 Here it looks like 9 weeks before departure would be the best, and 40 weeks before looks actually quite expensive. So when is the the best time to book? If you know that your destination is popular in the period you are going there, you are typically better off booking your ticket early. On the flip side though, if you are going when few others are going, you may actually gain from waiting and not book your ticket too early. If we instead look at a flight to Sydney, with no care for when during the year we are flying, the graph looks very different from London. For such a long flight you are typically better off booking your ticket as early as possible. Although, that is not always true either, as it may depend on tourist season at the destination, special events, etc. So how to handle all this? Here comes the good news: You don’t need to know about all these things - as this is exactly what Avionero is going to take care of for you! All you will need to do is to tell us what you are interested in, and we will find you a suitable flight. And not just the cheapest one, but one we think will actually fit you*. We may even advise you on when to book it. * We can’t bring you back in time, so if you really want to get the best tickets - make sure you start planning early. Before they get sold. That helps us help you.